CHANDIGARH, Nov 1 : Students, staff and management of Swift School of Pharmacy, (SSP) Rajpura organized Uday 2008- a cultural extravaganza, at campus today. Dr. Gopal Munjal, President, Swift Fundamental Research & Educational Society (SFRES) inaugurated the function. The programme started with the Shalok, Shabad Gayan and Sarawati Vandana. The students showed great enthusiasm and enthralled the audience with their mind blowing performances which included solo song, group dance, group song, skits, Bhangra, modeling, mime ad-mad show etc. One minute games were the other main attraction of the event. Dr. Gopal Munjal gave away the prizes to the winners. Speaking on the occasion, he announced a 100% scholarship for the students who feature in the merit list of the Punjab Technical University (PTU) exam. Dr. V. J. Dhar, Director, SSP said that such events help the students to interact with each other which are beneficial in the future. Such events are a means of bringing forward the talent of students and instill confidence in them. The institute would always welcome such gestures of the students, he added. He also congratulated the winners of the event and wished them good luck. 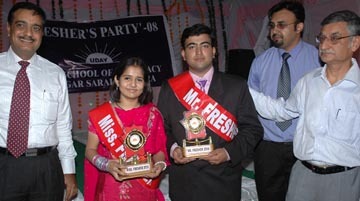 Hitesh and Shivani were adjudged Mr. and Ms. Fresher respectively at the function.